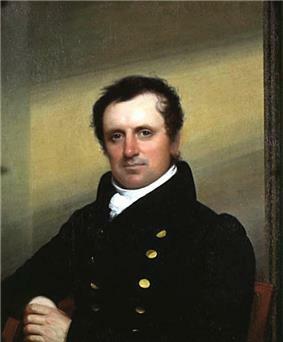 James Fenimore Cooper (September 15, 1789 – September 14, 1851) was a prolific and popular American writer of the early 19th century. His historical romances of frontier and Indian life in the early American days created a unique form of American literature. He lived most of his life in Cooperstown, New York, which was founded by his father William on property he owned. Cooper was a lifelong member of the Episcopal Church and in his later years contributed generously to it. He attended Yale University for three years, where he was a member of the Linonian Society, but was expelled for misbehavior. Before embarking on his career as a writer he served in the U.S. Navy as a Midshipman, which greatly influenced many of his novels and other writings. The novel that launched his career was The Spy, a tale about counterespionage set during the Revolutionary War and published in 1821. 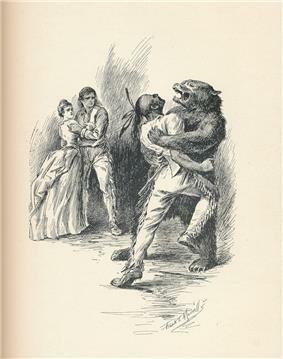 He also wrote numerous sea stories and his best-known works are five historical novels of the frontier period known as the Leatherstocking Tales. Among naval historians Cooper's works on the early U.S. Navy have been well received, but they were sometimes criticized by his contemporaries. Among his most famous works is the Romantic novel The Last of the Mohicans, often regarded as his masterpiece. 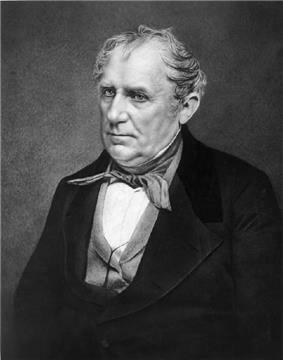 James Fenimore Cooper was born in Burlington, New Jersey in 1789, to William Cooper and Elizabeth (Fenimore) Cooper, the eleventh of 12 children, most of whom died during infancy or childhood. He was descended from James Cooper, of Stratford-upon-Avon, England, who emigrated to the American colonies in 1679. James and his wife were Quakers who purchased plots of land in New Jersey and Pennsylvania. Seventy-five years after his arrival in America, his great-grandson, William, was born on December 2, 1754. Shortly after James' first birthday, his family moved to Cooperstown, New York, a community founded by his father on a large piece of land which he had bought for development. Later his father was elected as a United States Congressman from Otsego County. Their town was in a central area of New York that had previously been occupied by the Iroquois of the Six Nations. The Iroquois were forced to cede their territory after British defeat in the Revolutionary War, as they had been allies. Shortly after the American Revolutionary War, the state opened up these former Iroquois lands for sale and development. Cooper's father purchased several thousand acres of land in upstate New York along the head-waters of the Susquehanna River. By 1788, William Cooper had selected and surveyed the site where Cooperstown would be established. He erected a home on the shore of Otsego lake, and in the autumn of 1790 moved his family there. He soon began construction of the mansion that would be known as Otsego Hall. It was completed in 1799 when James was ten. At the age of 13, Cooper was enrolled at Yale, but, after inciting a dangerous prank that involved blowing up another student's door (after having already locked a donkey in a recitation room ), Cooper was expelled in his third year without completing his degree. Disenchanted with college, he obtained work in 1806 as a sailor and at the age of 17 joined the crew of a merchant vessel. By 1811, he obtained the rank of midshipman in the fledgling United States Navy, conferred upon him on an officer's warrant signed by Thomas Jefferson. At 20, Cooper inherited a fortune from his father. On January 1, 1811, at age 21, he married Susan Augusta de Lancey, at Mamaroneck, Westchester County, New York. She was the daughter of a wealthy family who remained loyal to Great Britain during the American Revolution. They had seven children, five of whom lived to adulthood. Their daughter Susan Fenimore Cooper was a writer on nature, female suffrage, and other topics. She and her father often edited each other's work. Among his descendants was Paul Fenimore Cooper (1899–1970), who also became a writer. Their next voyage would take them to the Mediterranean along the coast of Spain, including Águilas and Cabo de Gata where they picked up cargo to be taken back to America. Their stay in Spain lasted several weeks and impressed the young sailor, the accounts of which Cooper would later refer to in his Mercedes of Castile, a novel about Columbus. After serving aboard the Sterling for 11 months, Cooper joined the United States Navy on January 1, 1808, when he received his commission as a midshipman. Because Cooper had conducted himself well as a sailor, his father, a former U.S. Congressman, easily secured a commission for his son through his long-standing connections with politicians and naval officials. The warrant for Cooper's commission as midshipman was signed by President Jefferson and mailed by Naval Secretary Robert Smith, reaching Cooper on February 19. Along with the warrant was a copy of naval rules and regulations, a description of the required naval uniform along with an oath that Cooper was to sign in front of a witness and to be returned with his letter of acceptance. Cooper signed the oath and had it notarized by New York attorney William Williams, Jr., who had previously certified the Sterling's crew. After Williams had confirmed Cooper's signature, Cooper mailed the document to Washington. On February 24 he received orders to report to the naval commander at New York City. [note 2] Joining the United States Navy fulfilled an aspiration Cooper had had since his youth. After completion of the Oneida in 1809, Cooper accompanied Woolsey to Niagara Falls, and was then ordered to Lake Champlain to serve aboard a gunboat until the winter months when the lake froze over. On November 13 of the same year he was assigned to the USS Wasp under the command of Captain James Lawrence, who was from Burlington and a personal friend of Cooper's. Aboard this ship Cooper met his lifelong friend William Branford Shubrick, who was also a midshipman at the time. Cooper would later dedicate The Pilot, The Red Rover, and other writings to Shubrick. In 1820, Cooper's wife Susan wagered that he could write a book better than the one she was reading. In response to the wager, Cooper wrote the novel Precaution (1820). Its focus on morals and manners was influenced by Jane Austen's approach to fiction. He anonymously published Precaution and it received favorable notice from the United States and England. 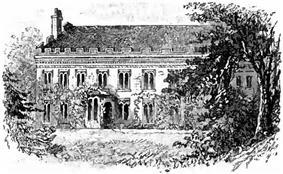 By contrast, his second novel, The Spy (1821), inspired by a tale related to him by neighbor and family friend John Jay, was more successful and became a bestseller; the setting of this Revolutionary War tale is widely believed to have been John Jay's family home, "The Locusts" in Rye, New York. In 1823, Cooper published The Pioneers, the first of the Leatherstocking series. The series features Natty Bumppo, a resourceful American woodsman at home with the Delaware Indians and their chief Chingachgook. Bumppo was also the main character of Cooper's most famous novel, The Last of the Mohicans (1826). Written in New York City, where Cooper and his family lived from 1822 to 1826, the book became one of the most widely read American novels of the 19th century. In 1823, while living in New York on Beach Street in what is now downtown's Tribeca, Cooper became a member of the Philadelphia Philosophical Society. In August of that year his first son died. In 1824 General Lafayette arrived from France aboard the Cadmus at Castle Garden in New York City as the nation's guest. Cooper witnessed his arrival and was one of the active committee of welcome and entertainment. In 1832 Cooper entered the lists as a political writer; in a series of letters to Le National, a Parisian journal, he defended the United States against a string of charges brought against them by the Revue Britannique. For the rest of his life, he continued skirmishing in print, sometimes for the national interest, sometimes for that of the individual, and not infrequently for both at once. This opportunity to make a political confession of faith reflected the political turn he already had taken in his fiction, having attacked European anti-republicanism in The Bravo (1831). Cooper continued this political course in The Heidenmauer (1832) and The Headsman: or the Abbaye of Vigneron (1833). The Bravo depicted Venice as a place where a ruthless oligarchy lurks behind the mask of the "serene republic". All were widely read on both sides of the Atlantic, though The Bravo was a critical failure in the United States. In 1833 Cooper returned to the United States and published A Letter to My Countrymen, in which he gave his version of the controversy and sharply censured his compatriots for their share in it. He followed up with novels and several sets of notes on his travels and experiences in Europe. His Homeward Bound and Home as Found are notable for containing a highly idealized self-portrait. In June 1834 Cooper decided to reopen his ancestral mansion, Otsego Hall, at Cooperstown. It had long been closed and falling into decay; he had been absent from the mansion nearly 16 years. Repairs were begun, and the house was put in order. At first, he wintered in New York City and summered in Cooperstown, but eventually he made Otsego Hall his permanent home. In 1844 Cooper's Proceedings of the naval court martial in the case of Alexander Slidell Mackenzie, a commander in the navy of the United States, &c:, was first published in Graham's Magazine of 1843–44. It was a review of the court martial of Alexander Slidell Mackenzie who while at sea, had hanged three crew members of the brig USS Sommers for mutiny. One of the hanged men, 19-year-old Philip Spencer, was the son of U.S. Secretary of War John C. Spencer. He was executed without court-martial along with two other sailors aboard the Somers for allegedly attempting mutiny. Prior to this affair Cooper was in the process of giving harsh review to Mackenzie's version of the Battle of Lake Erie. Mackenzie had previously given harsh criticism to Cooper's interpretation of the Battle of Lake Erie contained in Cooper's History of the Navy of the United States, 1839). However he still felt sympathetic to Mackenzie over his pending court martial. In May 1853, Cooper's Old Ironsides appeared in Putnam's Monthly, It was the history of the Navy ship USS Constitution, and became the first posthumous publication of his writings. In 1856, five years after Cooper's death, his History of the Navy of the United States of America was published. The work was an account of the U.S. Navy in the early 19th century. Among naval historians of the period the work has come to be recognized as a general and authoritative account, however it was criticized for accuracy on some points by other students of that period. For example, Cooper's account of the Battle of Lake Erie was said to be less than accurate by some naval historians. For making such claims Cooper once sued Park Benjamin, Sr., a poet and editor of the Evening Signal of New York, for libel. His books related to current politics and Cooper's self-promotion increased the ill feeling between author and public. The Whig press was virulent in its comments about him, and Cooper filed legal actions for libel, winning all his lawsuits. After concluding his last case in court, Cooper returned to writing with more energy and success than he had had for several years. On May 10, 1839, he published his History of the U.S. Navy, and returned to the Leatherstocking Tales series with The Pathfinder, or The Inland Sea (1840) and The Deerslayer (1841) and other novels. He wrote again on maritime themes, including Ned Myers, or A Life Before the Mast, which is of particular interest to naval historians. In the late 1840s Cooper returned to his public attacks on his critics and enemies in a series of novels called the Littlepage Trilogy where he defended landowners along the Hudson River, lending them social and political support against rebellious tenant farmers in the anti-rent wars that marked this period. In one of his later novels, The Crater, an allegory of the rise and fall of the United States, authored in 1848, his growing sense of historical doom was exemplified. At the end of his career he wrote a scornful satire about American social life and legal practices called The Ways of the Hour, authored in 1850.
Cooper spent the last years of his life back in Cooperstown. He died of dropsy on September 14, 1851, the day before his 62nd birthday. His interment was in Christ Episcopal Churchyard, where his father, William Cooper, was buried. Cooper's wife Susan survived her husband only by a few months and was buried by his side at Cooperstown. Several well-known writers, politicians, and other public figures honored Cooper's memory with a dinner in New York, six months after his death in February 1852. Daniel Webster presided over the event and gave a speech to the gathering while Washington Irving served as a co-chairman, along with William Cullen Bryant, who also gave an address which did much to restore Cooper's damaged reputation among American writers of the time. 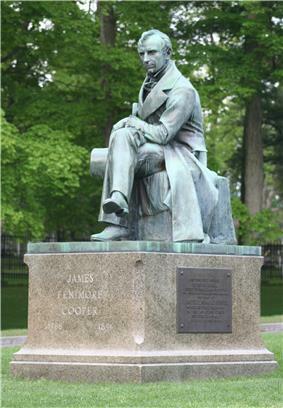 Cooper was one of the most popular 19th-century American authors, and his work was admired greatly throughout the world. While on his death bed, the Austrian composer Franz Schubert wanted most to read more of Cooper's novels. Honoré de Balzac, the French novelist and playwright, admired him greatly. Henry David Thoreau, while attending Harvard, incorporated some of Cooper's style in his own work. Cooper's work, particularly The Pioneers and The Pilot, demonstrate an early 19th-century American preoccupation with prudence and negligence in a country where property rights were often still in dispute. Though some scholars have hesitated to classify Cooper as a strict Romantic, Victor Hugo pronounced him greater than the great master of modern romance,. This verdict was echoed by a multitude of less famous readers, such as Balzac and Rudolf Drescher of Germany, who were satisfied with no title for their favorite less than that of the "American Scott." Mark Twain famously criticized The Deerslayer and The Pathfinder in his satirical but shrewdly observant essay, "Fenimore Cooper's Literary Offenses" (1895), which portrays Cooper's writing as cliched and overwrought. 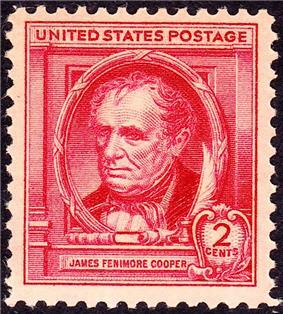 Cooper was honored on a U.S. commemorative stamp, the Famous American series, issued in 1940.
Cooper's lasting reputation today rests largely upon the five Leatherstocking tales. As for the remaining body of his work, literary scholar Leslie Fiedler, however, noted that Cooper's "collected works are monumental in their cumulative dullness." 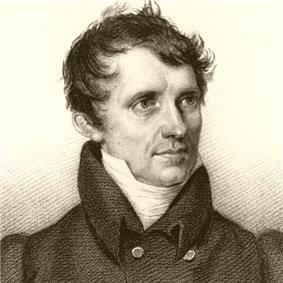 James Fenimore Cooper's novels were very popular in the rest of the world, including, for instance, Russia. In particular, great interest of Russian public in Cooper's work was primarily incited by the novel The Pathfinder. A novel, which the renowned Russian literary critic Belinsky declared to be "a Shakespearean drama in the form of a novel". Their author was more recognizable by his exotic to many in Russia middle name Fenimore, and this name specifically became a symbol of exciting adventures. For example, in the 1977 Soviet movie The Secret of Fenimore (Russian: Тайна Фенимора), being the third part of a children's television mini-series Three cheerful shifts (Russian: Три весёлые смены, see (1977)Tri vesyolye smeny at the Internet Movie Database), tells of a mysterious stranger addressed to as Fenimore, visiting nightly a boys' ward in a summer camp and relating fascinating stories about Indians and extraterrestrials. ^ At this time the British naval practice of seizing American sailors accusing them of desertion and impressing them into the British navy was common and is largely what led to the War of 1812. ^ The BravoJames Fenimore Cooper, , Oneonta University. ^ . Retrieved October 17, 2012.